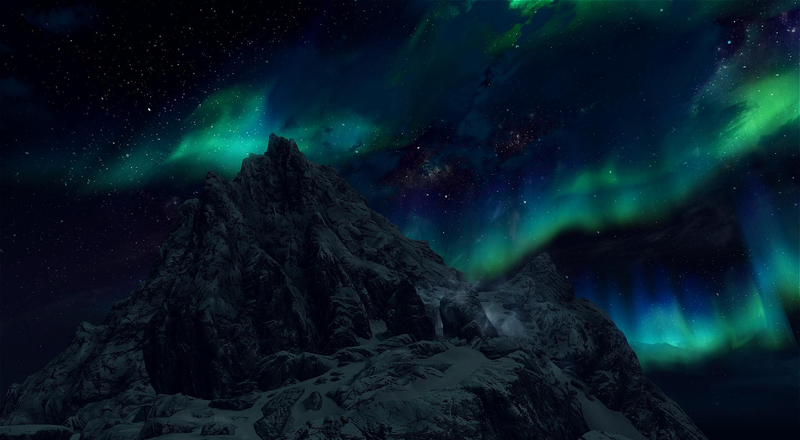 Within the landscape of video games Skyrim is a mountain. 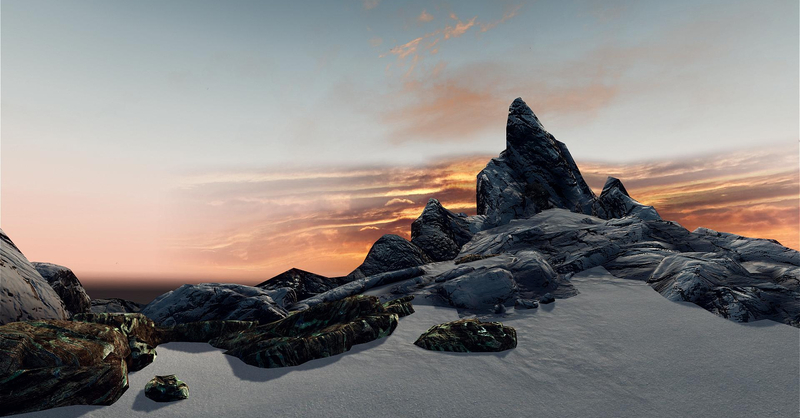 An open-world pioneer that helped define the desire for the arctic and alpine, it’s hard to think of mountainous terrain in games without thinking of The Elder Scrolls V. Like many a mountain, Skyrim seems an unconquerable prospect. Its map is a symbol-strewn patchwork of forts, towers, standing stones, camps and settlements. It’s a game of breadth, and – within ancient dwarf ruins and elven burial grounds – depth. Robert Macfarlane references the Greek word “kataskopos”, meaning to look down, or to spy or scout. Historically, this perspective was the domain of gods and birds — but also, briefly, mountaineers. Counter to this lofty impulse, Nan Shepherd, in her book The Living Mountain, puts forward the idea of understanding mountains as deep entities rather than pinnacle-points. Shepherd believed discovering the mystery of a mountain wouldn’t happen just by looking down, god-like, from a peak, but through more rooted and earthly exploration. Skyrim is a game at its best when you’re in the valleys amongst great pines and meandering streams, not atop its largest mountain — The Throat of the World. Ascending The Throat is unnaturally difficult. Climbing the Seven Thousand Steps (like the mountain itself, games are a step behind reality in regards to scale — there are less than a thousand steps here, and Tamriel’s tallest structure is half the size of Ben Nevis) leads to a monastery, home to a group of silent monks who worship the sky. This journey is important to the narrative, meaning the climb is unfortunately gated and lies outside the open discovery that drives the rest of the game. 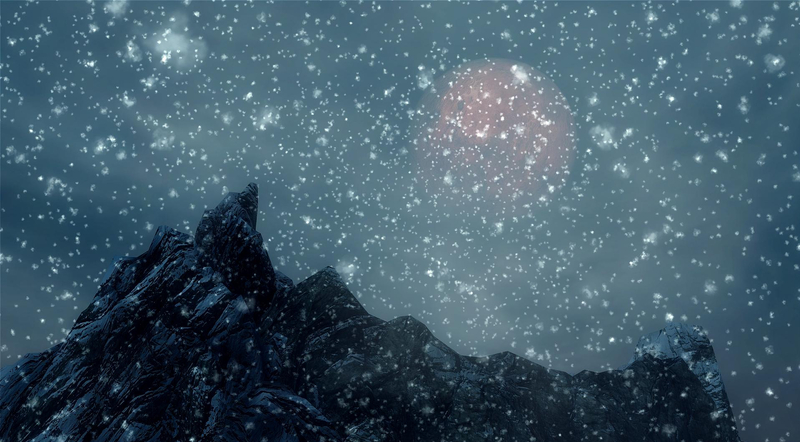 The blockage of the monastery, locked doors and rock formations which seek to make the mountain-top inaccessible, means what should be the apex of Skyrim’s vast world is in fact a narrow and unwild affair. Take the weather — a process which could easily escalate the hostility of the mountain. Instead of blizzards that naturally assault the player, there are precision pockets of wind all along the designated trail which kill you almost instantly and act as a barrier to progress. Scaling The Throat isn’t the only frustration — a sense of kataskopos is missing at the summit. Skyrim’s mountains were only designed to look formidable from below. From the ground the craggy ridges and peaks of rock and ice are dark and boundless, but from above an awkwardness reveals itself. No doubt limited by the tech of 2011, the game’s poor draw distance stands out. A black void sits between where the land abruptly ends and the artificial horizon begins. As you look out to the lands below like Caspar David Friedrich’s Wanderer above a Sea of Fog, only a great black band, like an abyss, stares back. 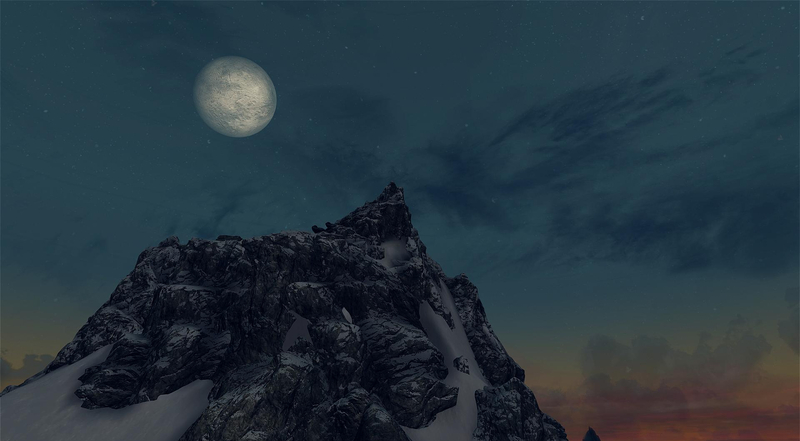 A good vantage point offers a glimpse of totality, a miniature world that puts everything into perspective — sublime only from below, Skyrim’s offers disappointment.